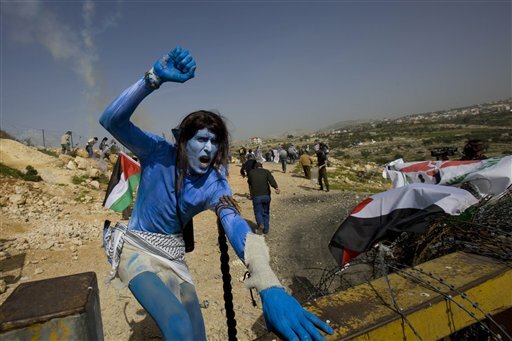 Palestinians as Na'vi from "Avatar"
A Demonstrator dressed as a figure of the movie 'Avatar', shouts slogans against Israel's separation barrier in the West Bank village of Bilin near Ramallah, Friday, Feb. 12, 2010. (AP Photo/Bernat Armangue)I haven't seen Avatar yet, but read enough about it to hear its heroes, the Na'vi, being compared to American Indians, Iraqis, Palestinians and anyone whose land is occupied and whose wealth has been plundered. More from AP or Haaretz. It's well worth reading Amira Hass' recent article about how the West Bank wall and the restrictions imposed on Palestinians living on its Western side is basically forcing yet another round of Jewish supremacist ethnic cleansing by Israel.